registered for Ph.D. 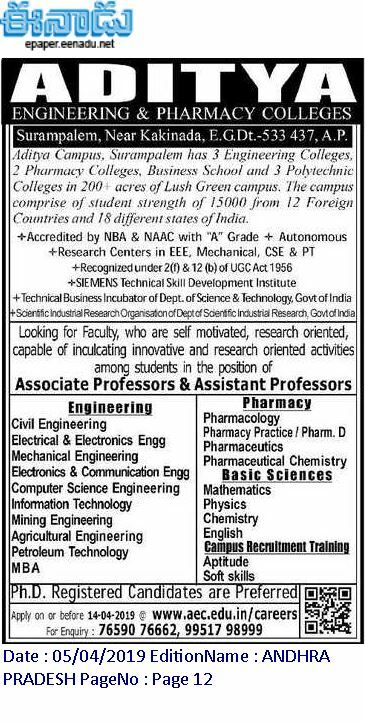 This recruitment is for the 3 Aditya Engineering Colleges and 2 Aditya Pharmacy Colleges. Aditya campuse surampalem comprises of 15000 students. Aditya campus also have the Business School and 3 Polytechnic Colleges. Necessary qualification having candidates can apply online for this Aditya Engineering/Pharmacy Colleges Assisant/Assocaite Professor jobs on or befor 14-04-2019. 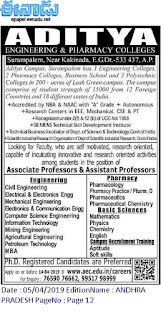 Detailed information about this Aditya Engineering/Pharamcy College Faculty jobs is updated below. Candidates selection is based on qualifications and merit in written exam. Candidates who are looking for jobs in Aditya Educational Institutions they can apply online via the official website of www.aec.edu.in/careers.